Bryozoans make a great pattern on a kelp frond. They don't appear to harm it, and they provide sustenance for some of the other small animals that live on kelp. Tasmania has kelp indistinguishable from ours in Southern California -- but populated by boxfish, puffers, and sea dragons. It's sort of an alternative underwater universe: upside-down, with kelp growing away from our northern-hemisphere ocean surface, but mirroring it in many ways. When I first visited Australia over 10 years ago, I wondered: Did this strange place, the world's lowest, geologically quietest continent, represent the future of our planet, or its past? After Antarctica (which seems scarcely to count), it's the worlds least fertile, driest, and least populated continent. With extinct volcanoes, nearly-extinct exotic mammals but overabundant cane toads and rabbits, downtrodden aborigines safeguarding Earth's oldest culture, a nation with 1/3 the population of California and 5 excellent newspapers: is this where our planet is going, or a quaint remnant of the prehistoric past? On my first dive into the Tasmanian kelp forests at Fortescue Bay, just south of Eaglehawk Neck, I realized: this land is a parable, from which we can learn. The kelp forests contain abalone not too different from ours, although much more plentiful; and sea urchins, including an invasive species that is moving southward along the coast, leaving urchin barrens behind. They have many species of wrasse, where we have just 3; but they have no rockfish, and we found no scuplins. 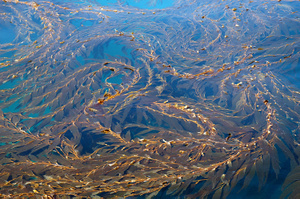 Sadly, the Tasmanian kelp forest is nearly gone, replaced by urchin barrens and smaller algae. Just a small patch is left. It's clearly overfished, even relative to California. Grab-all nets, basically floating gillnets 50 meters long, catch every creature that tangles in them. A recreational fishing license to set one costs A$50~US$32. On our third day of diving we came across a graball net that had lost its mooring buoys, and drifted for days, ghost-snagging a lobster (or a "cray" as the Aussies more accurately call them) and about 10 fish of every kind, most too small to eat. On one of my last dives at Cathedral Cove, gliding through caverns covered with yellow zooanthids, I realized that the Tasmanian kelp forest is complete in itself, although it shares its fundamental feature with our forests. Both are under great stress and may soon perish; but comparison of the two might help to preserve them. 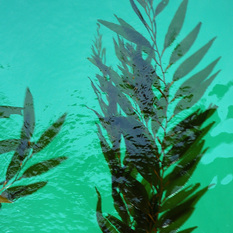 Kelp on the surface at Yellowbanks, near the East end of Santa Cruz Island. The buoyancy of the gas bladders on the kelp often lifts rocks off the seafloor. Macrocystis kelp floats near the surface.